The sake bomb or sake bomber is a drink made by pouring sake into a shot glass and dropping it into a glass of beer. Sometimes two chopsticks are placed parallel on top of the glass of beer, and the shot glass is balanced carefully between them. The drinker then chants "sake...sake...sake...BOMB! ", slamming the table with two balled fists, and the sake drops into the beer. It is to be consumed immediately, and works best with warm sake. Left: Two sake bombs about to drop. 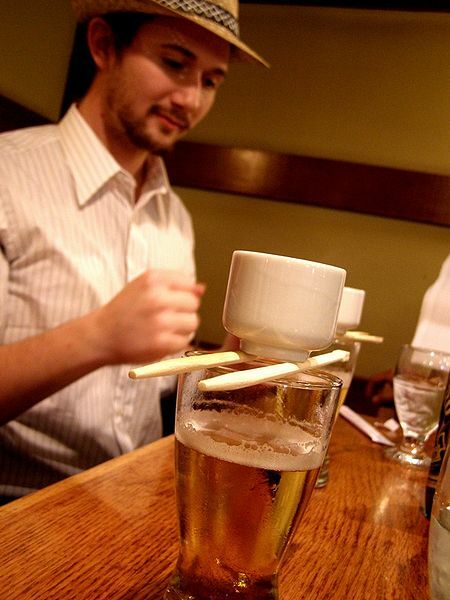 The Sake bomb is an entirely American concept and has been gaining popularity since its introduction. The sake bomb has become popular in Japan recently, where it is known as "Sake Blast," and "Atomic Bomb." Another variation of the sake bomb simply involves "bombing" a shot of lukewarm sake into chilled Red Bull (an energy drink) poured into a whiskey glass. This is best consumed immediately. The shot of sake is dropped into the beer, causing it to fizz violently. The drink should then be consumed immediately.